Taxis of Kharagpur are famous for making sharp turns. You are given the coordinates where a particular taxi was on a 2-D planes at N different moments: (x1, y1), (x2, y2), ..., (xN, yN). In between these coordinates, the taxi moves on a straight line. A turn at the i-th (2 ≤ i ≤ N-1) coordinate is said to be a sharp turn if the angle by which it turns at Point B = (xi, yi) when going from coordinates A = (xi-1, yi-1) to C = (xi+1, yi+1) via (xi, yi) is greater than 45 degrees. ie. suppose you extend the line segment AB further till a point D, then the angle DBC would be greater than 45 degrees. You have to identify whether the taxi made a sharp turn somewhere or not (Please look at Output section for details). If it made a sharp turn, also identify whether it is possible to change the coordinates at one of the N moments to make sure that the taxi doesn't make any sharp turn. Note that all the N pairs of coordinates (including the new coordinates) should be integers and distinct and should have their x and y coordinates at least 0 and at most 50. The first line of each test case contains a single integer N denoting the number of moments at which you are given the information of the taxi's coordinates. Each of the next N lines contains two space-separated integers xi and yi denoting the x and y coordinates of the taxi at i-th moment. For each test case, print a single line containing two space-separated strings, either of which can be a "yes" or "no" (without quotes). If there was no sharp turn, the first string should be "yes", and if there was a sharp turn, the first string should be "no". For the second string, you should tell whether it is possible to modify at most one coordinate in such a way that taxi doesn't make a sharp turn. Note that if the first string is "yes", then the second string would always be "yes". It's guaranteed that all (xi, yi) pairs are distinct. You can see that taxi is never making a sharp turn. You can see that taxi is making a sharp turn of 90 degrees, an angle greater than 45'. 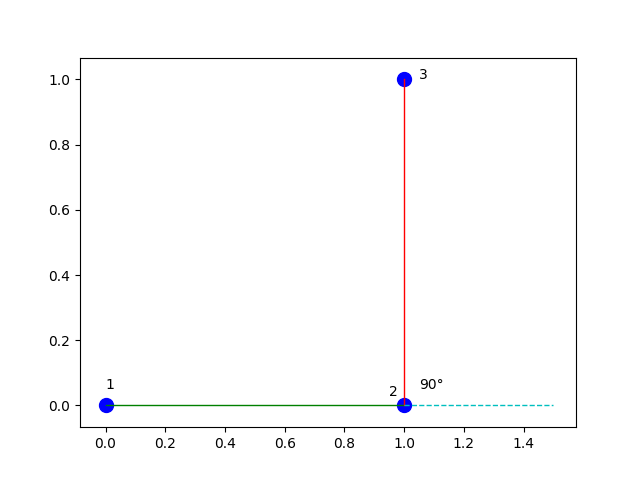 However, you can change the coordinates of the third points to (2, 1) to ensure that the angle remains <= 45'.